Is it enough to warn a smoker with a single cautionary message on the cigarette packet? The smoker needs to know the harmful consequences of smoking. Interestingly, the smoker already knows the health hazards that are created by each puff of a cigarette. Yet, smokers smoke. The psychological urge and some self-created physical needs for nicotine make it tougher for a smoker to quit the unhealthy and dangerous habit. A smoker may smoke for many different reasons; nonetheless it is addiction. It is addiction that makes the smoker lose the control over the will to quit smoking. Adult smokers give reasons of stress, hard work, anxiety, frustration or depression, loneliness or even over-crowding to defend smoking; whilst teenagers do not spare a chance to light a cigarette, just out of mere curiosity. Unfortunately, this same curiosity can chain a person for lifetime in the addiction. The old saying-where there is a will, there is a way- can prove its worth; if you want to quit smoking, you can certainly do so by following some easy guidelines. If you have the determination to give up, simply face your stress, anxiety, depression or deal with unpleasant events without the company of nicotine. Initially, the desire to smoke will try to take you over but resisting the urge repeatedly will help you. The psychological game may include another practice of telling oneself the good aspects of being a non-smoker. Again, to make the quitting plan more focused you can set a timeframe and can fix a very last day for a cigarette in your hand. While going through the 'quitting' phase your body may crave (temporarily) for sweet and your appetite may increase. In that case, you may consume a lot of juice. It will make your body adjust to the craving for sugar. A person whose smoking habit is associated with taking meal may try substituting it with fruit. Again, going for a walk, keeping yourself active will help you to get rid of the craving for nicotine. Drinking a lot of water will also help you to get rid of the bad habit and, also, detoxify your body. Besides you can keep the muscle of your mouth active by chewing hard candy, sugarless gum or cinnamon sticks. You can also decrease the number of cigarettes you smoke daily and gradually progress towards zero. You can overcome the dependence of your brain on the need of nicotine simply by the power of your will. 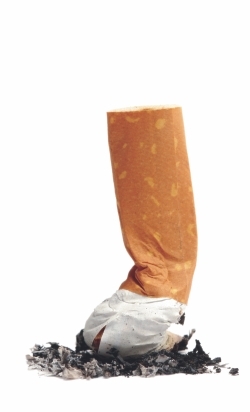 Just commit yourself and break the bad habit of smoking.